snare drummer before the Rockford show. 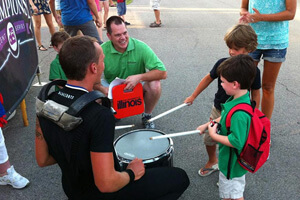 Drum Corps International's Tour of Champions event series kicked off on Sunday, July 17 in Rockford, Ill., featuring the Blue Devils, Blue Stars, Bluecoats, Cadets, Carolina Crown, Cavaliers, Phantom Regiment and Santa Clara Vanguard. The first of this five-event showcase gave fans up-close, exclusive access to the corps members and to exciting live entertainment. From roving pre-show performances, "Instant Encores" by each corps, and a chance for fans to text-message vote for their favorite group at the end of the night, the inaugural TOC event brought a new level of drum corps entertainment to the sold-out crowd in attendance. View a photo gallery from the Rockford event. Learn more about the Tour of Champions series. Don't miss these upcoming Tour of Champions events!